San Diego’s Comic-Con International is Coming! It’s rapidly approaching that time of year again, when over 100,000 people, including John Mayo of ComicBookPage, and Kay Kellam, of PopArtsPlace, gather in San Diego and create their own unique, if temporary, realm of Pop Culture … I’m not even sure what word to put here. For some this is a form of Mecca, for others it is simply a form of controlled chaos they can not imagine their lives without. Two years ago John and Kay sat down to talk about what they felt it was worth knowing before attending Comic-Con, and created a Podcast titled the Comic-Con Quick Start Guide. A great many of the points in that podcast remain relevant from one year to the next… so… it feels like an appropriate time to repost that podcast, and help folks start preparing for the annual gathering of creators, fans, vendors, publicists, spectators, and folks who are grateful to live in the modern age of technology that helps so many people bring the fruits of their imaginations into our lives. John Mayo, of ComicBookPage, and Kay Kellam, of PopArtsPlace, give some useful advice to get your Comic-Con international experience off to a quick start. 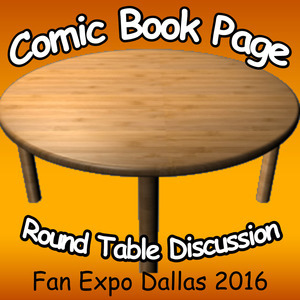 This entry was posted in Convention, Podcast, Podcasts, PopArtsPlace and tagged 2014, Comic-Con International, ComicBookPage, John Mayo, Kay Kellam, Quick Start, San Diego Comic-Con on June 26, 2016 by Kay.